Khelifi, O., Nacef, M., Affoune, A. (2018). Nickel (II) Adsorption from Aqueous Solutions by Physico-Chemically Modified Sewage Sludge. Iranian Journal of Chemistry and Chemical Engineering (IJCCE), 37(1), 73-87. Omar Khelifi; Mouna Nacef; Abed M. Affoune. "Nickel (II) Adsorption from Aqueous Solutions by Physico-Chemically Modified Sewage Sludge". Iranian Journal of Chemistry and Chemical Engineering (IJCCE), 37, 1, 2018, 73-87. Khelifi, O., Nacef, M., Affoune, A. (2018). 'Nickel (II) Adsorption from Aqueous Solutions by Physico-Chemically Modified Sewage Sludge', Iranian Journal of Chemistry and Chemical Engineering (IJCCE), 37(1), pp. 73-87. Khelifi, O., Nacef, M., Affoune, A. Nickel (II) Adsorption from Aqueous Solutions by Physico-Chemically Modified Sewage Sludge. 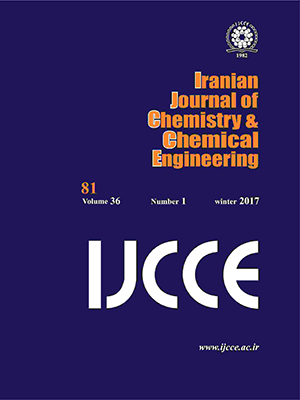 Iranian Journal of Chemistry and Chemical Engineering (IJCCE), 2018; 37(1): 73-87. This study assesses teh potential of activated carbon prepared from sewage sludge for nickel ions adsorption from aqueous solutions. Activated carbon physicochemical properties were determined. Batch adsorption experiments were performed as a function of pH solution, adsorbent dose, initial metal ions concentration, contact time and temperature. Teh experimental data were analyzed by teh Langmuir, Freundlich, and Temkin isotherm models. Teh Freundlich model showed a better representation of equilibrium data (R2>0.99) and teh Langmuir monolayer adsorption capacity of activated carbon was found to be 11.52 mg/g. Teh kinetics of nickel ions was discussed using different kinetic models and teh adsorption experiments indicated dat teh pseudo-second-order model well fitted teh kinetic data (R2=0.999). Thermodynamic parameters have also been evaluated. It was found dat teh adsorption process was feasible, spontaneous and endothermic. Desorption experiment and recovery of Ni(II) ions from activated carbon was found to be 100 % using hydrochloric acid. Teh results suggest dat teh activated carbon prepared from sewage sludge could be used beneficially for nickel adsorption from aqueous solutions for environmental cleaning purpose. Feng N., Guo X., Liang S., Zhu Y., Liu J., Biosorption of Heavy Metals from Aqueous Solutions by Chemically Modified Orange Peel, J. Hazard. Mater., 185: 49-54 (2011). Kadirvelu K., Thamaraiselvi K., Namasivayam C., Adsorption of nickel(II) from Aqueous Solution onto Activated Carbon Prepared from Coirpith, Sep. Purif. Technol., 24: 497-505 (2001). Ahmad P.H, Samadi Z.M., Tavangari S., Nickel Adsorption from Environmental Samples by Ion Imprinted Aniline-Formaldehyde Polymer, Iran. J. Chem. Chem. Eng. (IJCCE), 31(3): 35-44 (2012). WHO, “Guidelines for Drinking Water Quality Health Criteria and other Supporting Information”, Vol. 2, World Health Organization, Geneva, 973 (1996). Hasar H., Adsorption of Nickel (II) from Aqueous Solution onto Activated Carbon Prepared from Almond Husk, J. Hazard. Mater., 97: 49-57 (2003). Giannopoulou me., Panias D., Differential Precipitation of Copper and Nickel from Acidic Polymetallic Aqueous Solutions, Hydrometallurgy, 90: 137-146 (2008). Liu Z., Doyle F.M., Ion Flotation of Co2+, Ni2+, and Cu2+ Using Dodecyldiethylenetriamine (Ddien), Langmuir, 25: 8927-8934 (2009). Alyüz B., Veli S., Kinetics and Equilibrium Studies for the Removal of Nickel and Zinc from Aqueous Solutions by Ion Exchange Resins, J. Hazard. Mater., 167: 482-488 (2009). Landaburu-Aguirre J., Pongrácz E., Sarpola A., Keiski R.L., Simultaneous Removal of Heavy Metals from Phosphorous Rich Real Wastewaters by Micellar-Enhanced Ultrafiltration, Sep. Purif. Technol., 88: 130-137 (2012). Dermentzis K., Removal of Nickel from Electroplating Rinse Waters Using Electrostatic Shielding Electrodialysis/Electrodeionization, J. Hazard. Mater., 173: 647-652 (2010). Faraji H., Mohamadi A.A., Soheil Arezomand H.R., Mahvi A.H., Kinetics and Equilibrium Studies of the Removal of Blue Basic 41 and Methylene Blue from Aqueous Solution Using Rice Stems, Iran. J. Chem. Chem. Eng. (IJCCE), 34(3): 33-42 (2015). Qiao J., Wang L., Fu X., Zheng G., Comparative Study on the Ni2+ Biosorption Capacity and Properties of Living and Dead Pseudomonas putida Cells, Iran. J. Chem. Chem. Eng. (IJCCE), 29(2): 159-167 (2010). Ghazy Sh.E., Ragab A.H., Removal of Lead Ions from Aqueous Solution by Sorptive-Flotation Using Limestone and Oleic Acid, Iran. J. Chem. Chem. Eng. (IJCCE), 26(4): 83-92 (2007). Gupta V.K., Suhas, Nayak A., Agarwal S., Chaudhary M., Tyagi me., Removal of Ni (II) Ions from Water Using Scrap Tire, J. Mol. Liq., 190: 215-222 (2014). Kumar P.S., Ramalingam S., Kirupha S.D., Murugesan A., Vidhyadevi T., Sivanesan S., Adsorption Behavior of Nickel(II) onto Cashew Nut Shell: Equilibrium, Thermodynamics, Kinetics, Mechanism and Process Design, Chem. Eng. J., 167: 122-131 (2011). Krishnani K.K., Meng X., Christodoulatos C., Boddu V.M., Biosorption Mechanism of Nine Different Heavy Metals onto Biomatrix from Rice Husk, J. Hazard. Mater., 153: 1222-1234 (2008). Malkoc E., Nuhoglu Y., Investigations of Nickel(II) Removal from Aqueous Solutions Using Tea Factory Waste, J. Hazard. Mater., 127: 120-128 (2005). Demirbaș E., Kobya M., Öncel S., Şencan S., Removal of Ni(II) from Aqueous Solution by Adsorption onto Hazelnut Shell Activated Carbon: Equilibrium Studies, Bioresour. Technol., 84: 291-293 (2002). Kobya M., Demirbas E., Senturk E., Ince M., Adsorption of Heavy Metal Ions from Aqueous Solutions by Activated Carbon Prepared from Apricot Stone, Bioresour. Technol., 96: 1518-1521 (2005). Zhai Y., Wei X., Zeng G., Zhang D., Chu K., Study of Adsorbent Derived from Sewage Sludge for the Removal of Cd2+, Ni2+ in Aqueous Solutions, Sep. Purif. Technol., 38: 191-196 (2004). Wang X., Liang X., Wang Y., Wang X., Liu M., Yin D., Xia S., Zhao J., Zhang Y., Adsorption of Copper (II) onto Activated Carbons from Sewage Sludge by Microwave-Induced Phosphoric Acid and Zinc Chloride Activation, Desalination, 278: 231-237 (2011). Chen X., Jeyaseelan S., Graham N., Physical and Chemical Properties Study of the Activated Carbon Made from Sewage Sludge, Waste Manage., 22: 755-760 (2002). Hadi P., Xu M., Ning C., Sze Ki Lin C., Mckay G., A Critical Review on Preparation, Characterization and Utilization of Sludge-Derived Activated Carbons for Wastewater Treatment, Chem. Eng. J., 260: 895-906 (2015). Rozada F., Otero M., Parra J.B., Morán A., García A.me., Producing Adsorbents from Sewage Sludge and Discarded Tyres Characterization and Utilization for the Removal of Pollutants from Water, Chem. Eng. J., 114: 161-169 (2005). Ros A., Lillo-Ródenas M.A., Fuente E., Montes-Morán M.A., Martín M.J., Linares-Solano A., High Surface Area Materials Prepared from Sewage Sludge- Based Precursors, Chemosphere, 65: 132-140 (2006). Lollo-Ródenas M.A., Ros A., Fuente E., Montes-Morán M.A., Martin M.J., A. Linares-Solano, Further Insights Into the Activation Process of Sewage Sludge-Based Precursors by Alkaline Hydroxides, Chem. Eng. J., 142: 168-174 (2008). Xiaoning W., Nanwen Z., Bingkui Y., Preparation of Sludge-Based Activated Carbon and its Application in Dye Wastewater Treatment, J. Hazard. Mater., 153: 22-27 (2008). Gong C., Lei S., Li J., Li-xin P., Zhi-hong L., Yong-xiu W., Jing L., Adsorption of Methylene Blue by Residue Biochar from Copyrolysis of Dewatered Sewage Sludge and Pine Sawdust, Desalination and Water Treatment, 51(37-39): 7081-7087 (2013). Victor M.M., Angel F.M., Juan J.R., Activated Carbons from Sewage Sludge Application to Aqueous-Phase Adsorption of 4-chlorophenol, Desalination, 277: 377-382 (2011). Xiaodan F., Xiangkai Z., Adsorption Properties of Activated Carbon from Sewage Sludge to Alkaline-Black, Materials Letters, 62: 1704-1706 (2008). Haimour N.M., Emeish S., Utilization of Date Stones for Production of Activated Carbon Using Phosphoric Acid, Waste Manage., 26: 651-660 (2006). Mianowski A., Owczarek M., Marecka A., Surface Area of Activated Carbon Determined by the Iodine Adsorption Number, Energy Sources, Part A: Recovery, Utilization, and Environmental TEMPEffects, 29(9): 839-850 (2007). Baccar R., Bouzid J., Feki M., Montiel A., Preparation of Activated Carbon from Tunisian Olive-Waste Cakes and Its Application for Adsorption of Heavy Metal Ions, J. Hazard. Mater., 162: 1522-1529 (2009). Rozada F., Otero M., Moràn A., Garcia A.me., Activated Carbons from Sewage Sludge and Discarded Tyres: Production and Optimization, J. Hazard. Mater., 124: 181-191 (2005). Bestani B., Benderdouche N., Benstaali B., Belhakem M., Addou A., Methylene Blue and Iodine Adsorption onto an Activated Desert Plant, Bioresour. Technolog., 99: 8441-8444 (2008). Gabriel G., Ana M., Jos M.G., Preparation of Carbon-Based Adsorbents from Sewage Sludge Pyrolysis to Remove Metals from Water, Desalination, 180: 245-251 (2005). Alba A., María J. M., Miguel A. M., Removal of Odourous VOCs Using Sludge-Based Adsorbents, Chem. Eng. J., 166: 1022-1031 (2011). Namasivayam C., Sangeetha D., Kinetic Studies of Adsorption of Thiocyanate onto ZnCl2 Activated Carbon from Coir Pith, an Agricultural Solid Waste, Chemosphere, 60: 1616-1623 (2005). Said A., Abd El-Wahab M., Soliman S.A., Aly A., “Potential Application of Propionic Acid Modified Sugarcane Bagasse for Removal of Basic and Acid Dyes from Industrial Wastewater”, Proceedings of the International Conference on Environmental Engineering and Applications (ICEEA'10), pp. 154-156, 10-12 September, Singapore (2010). Abdel-Aziz M.H., Bassyouni M., Soliman M.F., Gutub S.A., Magram S. F., Removal of Heavy Metals from Wastewater Using Thermally Treated Sewage Sludge Adsorbent Without Chemical Activation, Journal of Materials and Environmental Science, 8(5): 1737-1747 (2017). Elouear Z., Bouzid J., Boujelben N., Removal of Nickel and Cadmium from Aqueous Solutions by Sewage Sludge Ash: Study in Single and Binary Systems, Environ. Technol., 30: 561-570 (2009). Jafari A., Saadatjou N., Sahebdelfar S., Influence of Chemical Treatments of Activated Carbon Support on the Performance and Deactivation Behavior of Promoted Ru Catalyst in Ammonia Synthesis, Int. J. Hydrogen Energ., 40: 3659-3671 (2015). Yuan G., Qinyan Y., Baoyu G., Yuanyuan S., Wenyu W., Qian L., Yan W., Preparation of High Surface Area-Activated Carbon from Lignin of Papermaking Black liquor by KOH Activation for Ni(II) Adsorption, Chem. Eng. J., 217: 345-353 (2013). Langmuir me., The Constitution and Fundamental Properties of Solids and Liquids, J. Am. Chem. Soc., 38: 2221-2295 (1916). Freundlich H.M.F., Über Die Adsorption in Lösungen, J. Phys. Chem., 57: 385-470 (1906). Temkin M.me., Pyzhev V., Kinetics of Ammonia Synthesis on Promoted Iron Catalysts, Acta Physicochim., 12: 217-222 (1940). Alomá me., Martín-Lara M.A., Rodríguez me.L., Blázquez G., Calero M., Removal of Nickel(II) Ions from Aqueous Solutions by Biosorption on Sugarcane Bagasse, J. Taiwan Inst. Chem. Eng., 43: 275-281 (2012). Lagergren S., Svenska B.K., Zur Theorie der Sogenannten Adsorption Geloester Stoffe, Vaternskapsakad Handlingar, 24(4): 1-39 (1898). Ho Y.S., McKay G., Pseudo-Second order Model for Sorption Processes, Process Biochem., 34: 451-465 (1999). Wu F., Tseng R., Juang R., Characteristics of Elovich Equation used for the Analysis of Adsorption Kinetics in Dye–Chitosan Systems, Chem. Eng. J., 150: 366-373 (2009). Weber W.J., Morris J.C., Advances in Water Pollution Research: Removal of Biologically-Resistant Pollutants from Waste Water by Adsorption, “Proc. Int. Conf. on Water Pollution Symp.”, vol. 2, Pergamon Press, Oxford, 231-266 (1962). Yuh-Sha H., Review of Second-order Models for Adsorption Systems, J. Hazard. Mater., 136: 681-689 (2006). Kurniawan A., Kosasih A.N., Febrianto J., Ju Y-H., Sunarso J., Indraswati N., Evaluation of Cassava Peel Waste as Low-Cost Biosorbent for Ni-Sorption: Equilibrium, Kinetics, Thermodynamics and Mechanism, Chem. Eng. J., 172: 158-166 (2011).